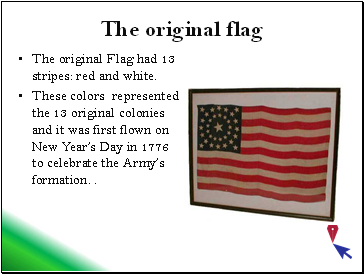 The original Flag had 13 stripes: red and white. 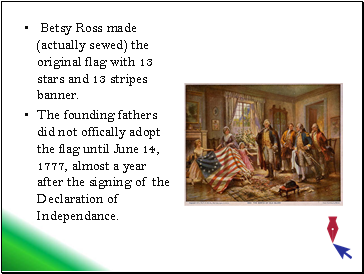 These colors represented the 13 original colonies and it was first flown on New Year’s Day in 1776 to celebrate the Army’s formation. .
Betsy Ross made (actually sewed) the original flag with 13 stars and 13 stripes banner. The founding fathers did not offically adopt the flag until June 14, 1777, almost a year after the signing of the Declaration of Independance. 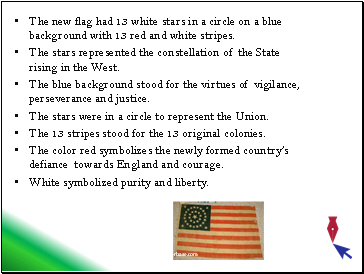 The new flag had 13 white stars in a circle on a blue background with 13 red and white stripes. The stars represented the constellation of the State rising in the West. The blue background stood for the virtues of vigilance, perseverance and justice. The stars were in a circle to represent the Union. The 13 stripes stood for the 13 original colonies. The color red symbolizes the newly formed country’s defiance towards England and courage. White symbolized purity and liberty. 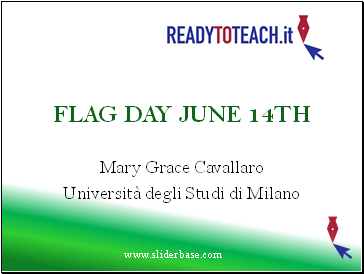 The first official Flag Day celebration was June 14th, 1861 Later in history, President Woodrow Wilson proclaimed June 14th as “Flag Day” in 1916. 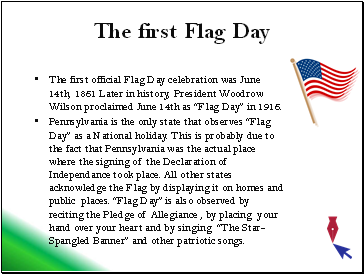 Pennsylvania is the only state that observes “Flag Day” as a National holiday. This is probably due to the fact that Pennsylvania was the actual place where the signing of the Declaration of Independance took place. All other states acknowledge the Flag by displaying it on homes and public places. “Flag Day” is also observed by reciting the Pledge of Allegiance , by placing your hand over your heart and by singing “The Star-Spangled Banner” and other patriotic songs. Find a synonym for ‘represent’. What do the colors represent, along with the stars? 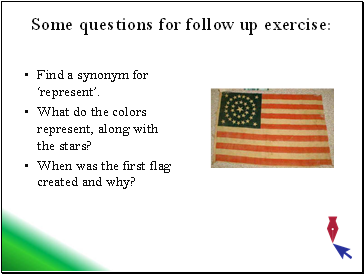 When was the first flag created and why? What do the colors of your flag represent? What does the US flag have in common with your flag? 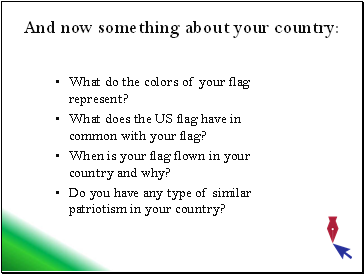 When is your flag flown in your country and why? Do you have any type of similar patriotism in your country?